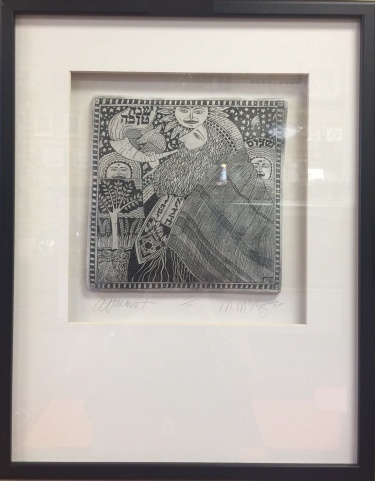 Stunning Rosh HaShana Drawing on Clay by Marsha McCarthy. It is part of a limited edition that are produced in series of 500 after which the molds are destroyed. This signed, dated and numbered piece will brighten up any household. At the top of the drawing is written Shana Tova (Happy New Year). A true work of art. Measures 19" x 15". Clay tile measures 8" x 8". Limited edition signed & dated. Marsha is a graduate of Boston's Museum School of Fine Arts where she studied painting. Her works are offered as framed limited and open edition tiles, vessels, plaques, boxes and ornaments.